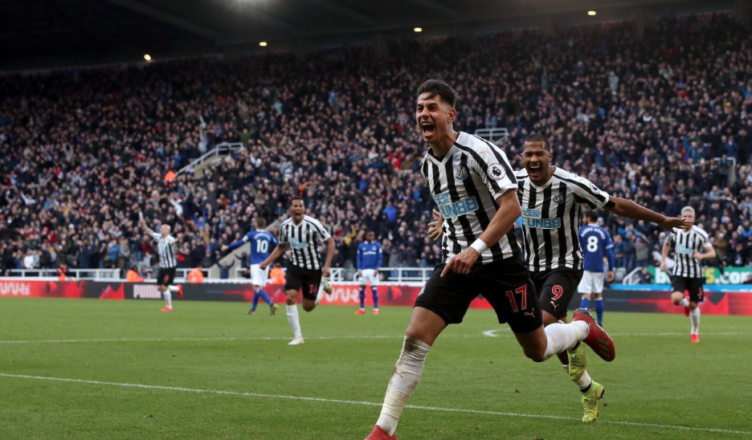 PLAYER RATINGS: Newcastle 3-2 Everton – One 9, one 8, several 7’s & a few 5’s.. – NUFC blog – Newcastle United blog – NUFC Fixtures, News and Forum. PLAYER RATINGS: Newcastle 3-2 Everton – One 9, one 8, several 7’s & a few 5’s..
An incredible afternoon at St James’ Park, with Ayoze Perez and 52,000 Geordies having the last laugh over Jordan Pickford. 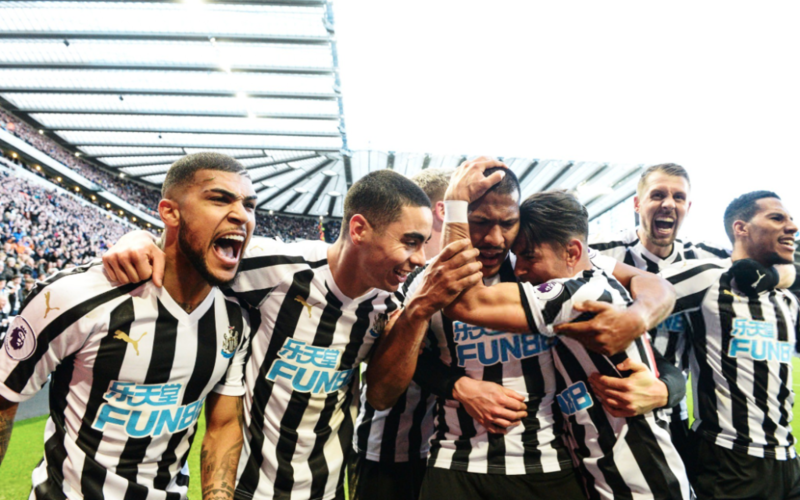 NUFC XI – (3-4-2-1): Dubravka (6) – Schar (5), Lascelles (5), Lejeune (6) – Yedlin (5), Hayden (7.5) , Ki (5), Ritchie (5) –– Perez (9), Almiron (7.5) – Rondon (8) – SUBS – Dummett (7), Kenedy (6), Shelvey (7). Dubravka – 6 – Had very little to do in all honesty, with Everton having just three shots on target. He claimed one dangerous cross in the first half, but could’ve done better with their second, with him parrying a low cut back into Richarlison’s path. Schar – 5 – The comeback was incredible, but Schar was below his best today for me. He battled well late on, but he was a little suspect for the majority of the game. We know he can carry the ball out of defence brilliantly or pick out a pass, but he took a few risks today and gave the ball away in bad areas at times. A petulant yellow card for throwing the ball away will also see him banned for upcoming games with Bournemouth and Arsenal, with him now reaching 10 cautions for the season. Lascelles – 5 – Looked quick and strong at times in the first half, showing impressive pace and power when either Everton attackers tried to get in behind, however he was at fault for the first goal, allowing him to ghost ahead of him and head home. He was withdrawn at the break with a knee injury. Lejeune – 6 – Looked pretty shaky in the first half, failing to clear or cut out the danger convincingly on more than one occasion, however he responded pretty well in the second half, standing strong and getting his foot on the ball to build attacks from the back. Yedlin – 5 – Put in some decent crosses in the second half but never convinced defensively, getting nowhere near Digne as he crosses for Calvert Lewin’s headed opener and struggling to get to grips with Bernard either. Hard to criticise when we pulled off such a brilliant result in the end, but he wasn’t great today. Hayden – 7.5 – Put in a huge shift up against Gomes and Gueye – which was needed given Ki looked below his best today. Won several aerial battles, got stuck in and was the driving force for us in midfield at times. Another brilliant shift from a man who’s gone from being a ‘liability’ to undroppable. Ki – 5 – Looked off the pace and gave away the ball far more than we saw him do when he was in the team and in great form late last year. A few nice passes through midfield or out wide, but you could tell he’d not played for a while. Seemed a little slow, sluggish and casual in midfield – something which was noticeable given Longstaff has been anything but that in recent weeks. Ritchie – 5 – It wasn’t his day today. His poor clearance allowed Everton to get the ball out wide and whip in a cross for their opener, he was knocked off the ball by Gomes for their second and his hard and low penalty was easily telegraphed by Pickford. Moved to a right-wing position after Rafa reverted to a 4-2-3-1 system late on, but was quickly replaced by Kenedy. Perez – 9 – I said to the bloke behind me at half time that he’d barely had a kick in the first 45, but he was an absolute menace in the second half. Not only did his superb link up play and clever assist set up Rondon, he then got himself in the right place at the right time and fired past Jordan Pickford twice to take it from 1-2 to 3-2. He bagged two goals and an assist in the final 45, but his all round play was superb in the second half, with him linking up brilliantly, battling for every ball and winning fouls or throw ins just when we needed them late on. Almiron – 7.5 – Another impressive home outing for the Paraguayan, with him being our most willing and threatening attacking outlet in the first half especially. He well and truly had the beating of Kenny and, although things didn’t always come off for me – with us seeing a few slack passes or touches here and there – he never gave up and was always trying to make things happen. His rasping 25-yard shot also played a big part in our equaliser, with it being too hot to handle for Pickford and leading to a Perez tap in as a result. Rondon – 8 – He was quiet in the first half and not quite his usual bulldozing self aside from the moment he won our penalty, however he was outstanding in the second half. He started the comeback, volleying past Pickford after linking up brilliantly with Perez and then played in a part in our winner, with him gambling on Hayden’s lobbed through ball and nudging it to Perez who fired past Pickford. His work rate and determination late on was outstanding, with his power and experience helping us get over the line. Dummett – 7 – Filled in for Lascelles at centre-back initially and moved over the left-back late on as we went back to a 4-2-3-1 system. Did a great job, being strong in the air and no nonsense on the ground – also getting back in the nick of time with a brilliant sliding challenge to stop Richarlison. Kenedy – 6 – Looked a little bit uneasy when he got the ball initially, but he put in a shift and worked back well to help Yedlin cope with Digne and Bernard. Shelvey – 7 – Only came on for the final 15 minutes, but he looked sharp and played a part in our stunning comeback. Set piece delivery was dangerous and picked out Yedlin’s right-hand side runs well too. On today’s showings, he should come in for Ki at Bournemouth.